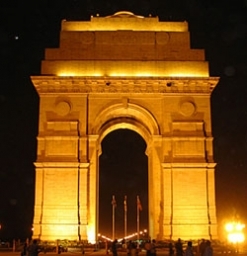 Students who participate in the new program in Delhi can explore the city's numerous historic landmarks, including the India Gate. MIDDLEBURY, Vt. ― Middlebury College has established a new program in India, the newest C.V. Starr-Middlebury School Abroad and the first in South Asia. Located in Delhi, the program will begin offering classes in the fall of 2013. Students will attend the University of Delhi’s St. Stephen’s College or its Lady Shri Ram College for Women. While the language of instruction is English at both colleges, all students will also study intensive Hindi at the American Institute of Indian Studies. Middlebury plans to enroll eight students initially, and students from any college or university may apply. With a metropolitan population of about 16.7 million residents, Delhi is a large metropolis that includes the capital of India, New Delhi. Continuously inhabited since the 6th century B.C., Delhi is rich in history and architecture. Today’s Delhi is also a bustling and diverse city, home to both ancient monuments and a modern arts, business and culture scene. According to Monod, those who enroll for a full academic year will have the opportunity to complete an internship and receive course credit for it, further immersing themselves in Indian daily life. The C.V. Starr-Middlebury Schools Abroad have more than 50 years of experience in providing academically challenging immersion programs and, with the addition of the site in Delhi, will operate programs in 37 cities and 16 countries. Students come from a wide range of academic fields and take courses in most disciplines, often alongside host-country students; intern or engage in volunteer work; and often live with a family or other local residents. At every juncture, students are encouraged to immerse themselves in the host culture. For more information, visit http://www.middlebury.edu/sa/ or contact Middlebury College International Programs at internationalprograms@middlebury.edu or 802-443-5745.